I’ve always said you can’t go wrong with the classic color combination of tan and black so when I seen Graphic 45’s Kraft Reflections Collection I knew I wanted to use it. I just had to wait for the right project to come along. And it did! This week we’re blog hopping with Xyron and Globecraft Memories! I’m on design teams for both these companies so it was fun to incorporate both my favorite products into one project using one of my favorite paper collections. 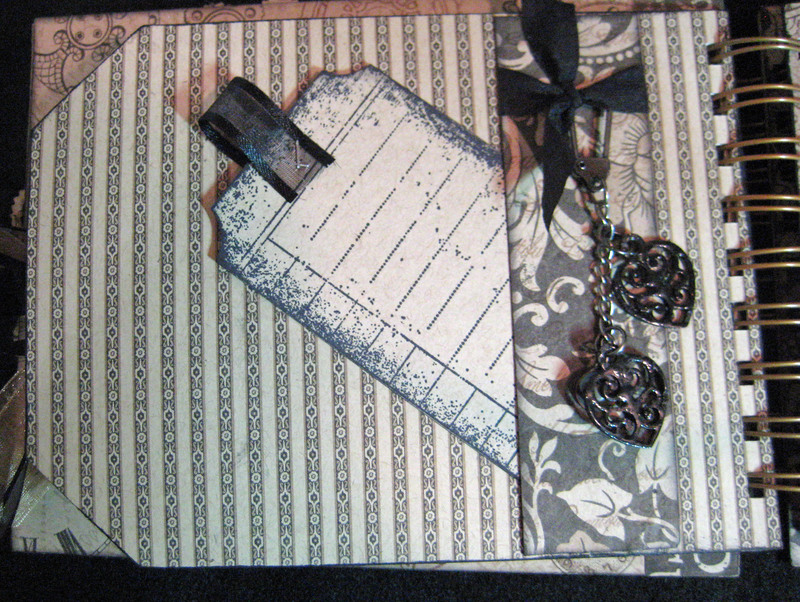 I started with the Bubble Brag Book Kit from Globecraft Memories, some Piccolo Decorative Accents and the papers. The bubble frame for the book cover has three layers and I decided I wanted the same paper on each layer. I picked Bed of Roses for them and set that aside to think about how to fill the bubble itself. 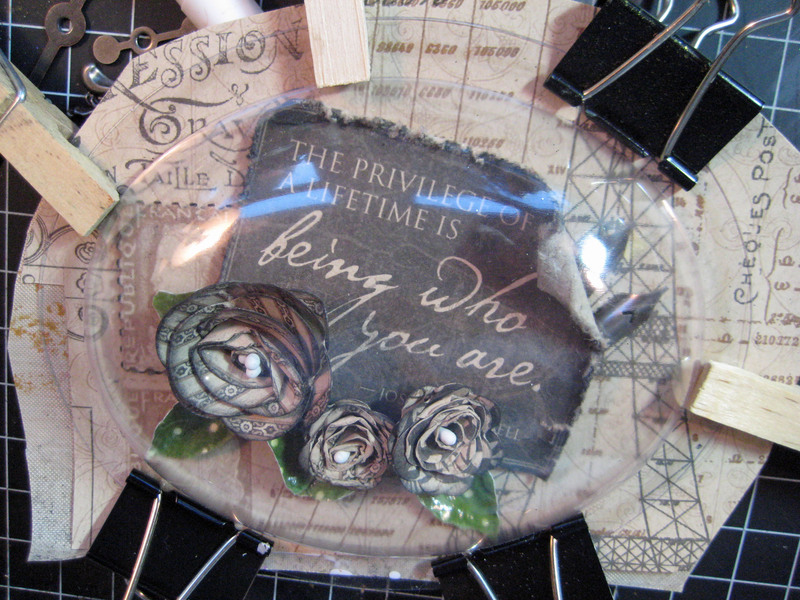 For this I selected a quote from the Quote…Unquote Kraft Reflections Collection. 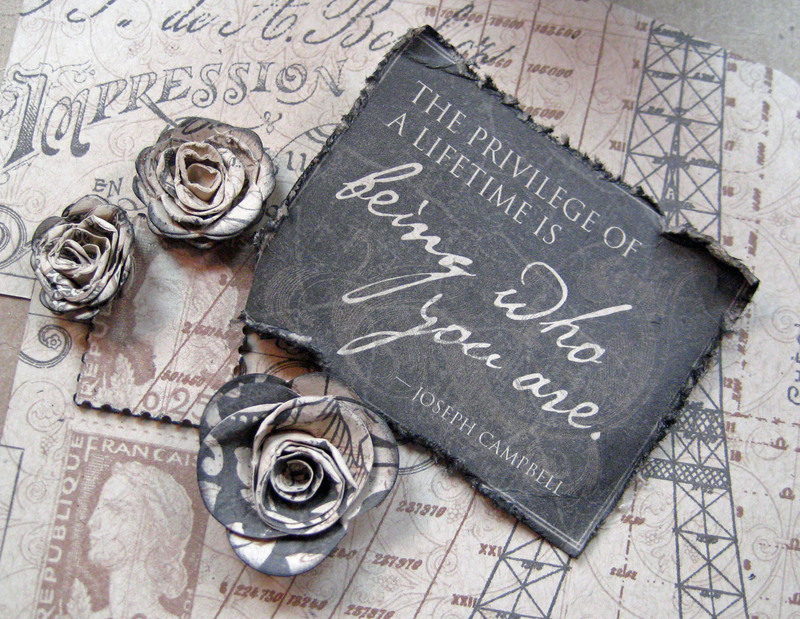 I cut it out, distressed and inked the edges then made some paper flowers with Sizzix Flowers, 3D die. 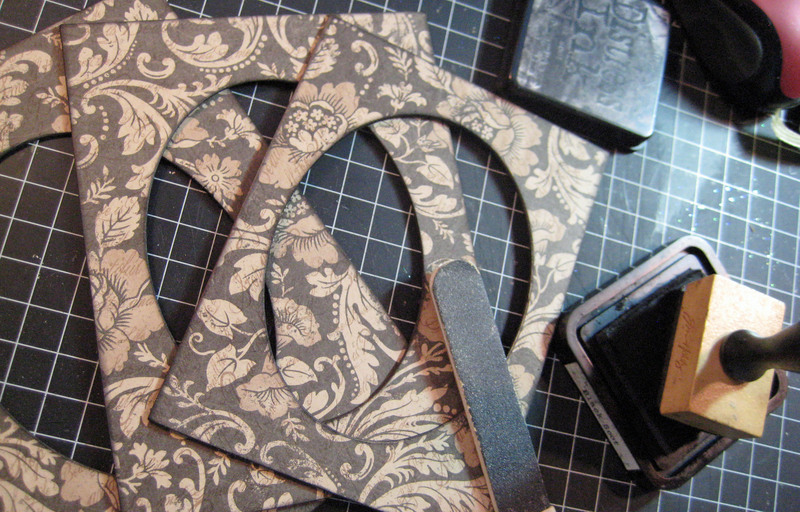 I hand cut the leaves and embossed them with clear embossing powder. I arranged all the pieces and tested it to make sure it all fit inside the bubble. You gotta love these bubble frames because you can build a dimensional scene that is totally protected. Once it was arranged to where I liked it and it all fit within the bubble I glued the bubble over the scene and clamped it with my clothespins and binder clips. 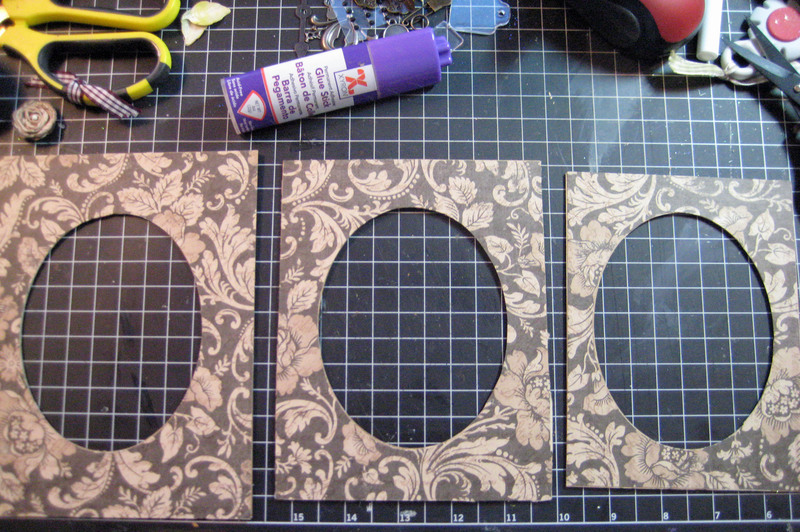 Then I set to work to cut, trim, ink and adhere my papers to the three-layer frame which is the book cover. The papers are adhered to the chipboard frames with Xyron Glue Stick then I sanded the outer and inner edges and inked them all with Black Soot Distress Ink. All of the pages are actually made from regular white envelopes that showed up at the local recycle center. They’ve been in a bin in my garage for about two years waiting for the perfect project to come along – yeah! 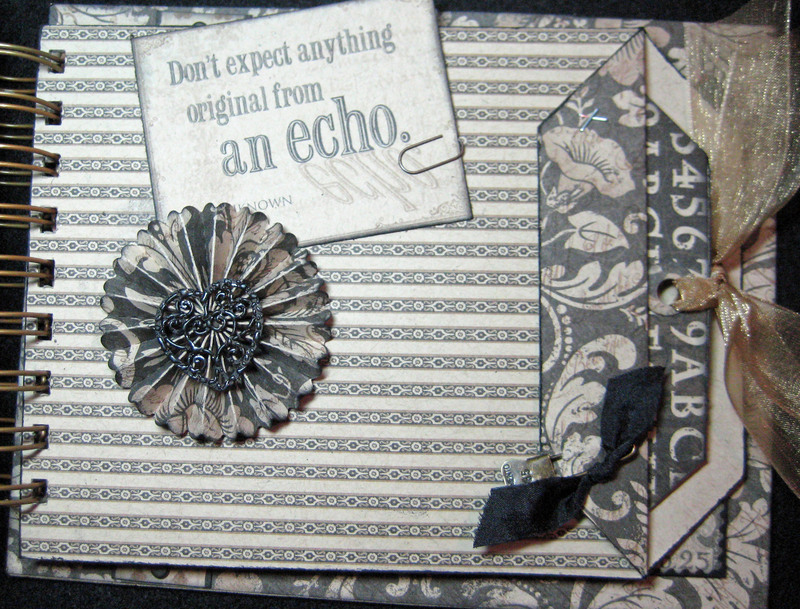 I used a method similar to what Stephanie at http://withagrin.blogspot.com/ shows in this video http://www.ustream.tv/recorded/20611252. 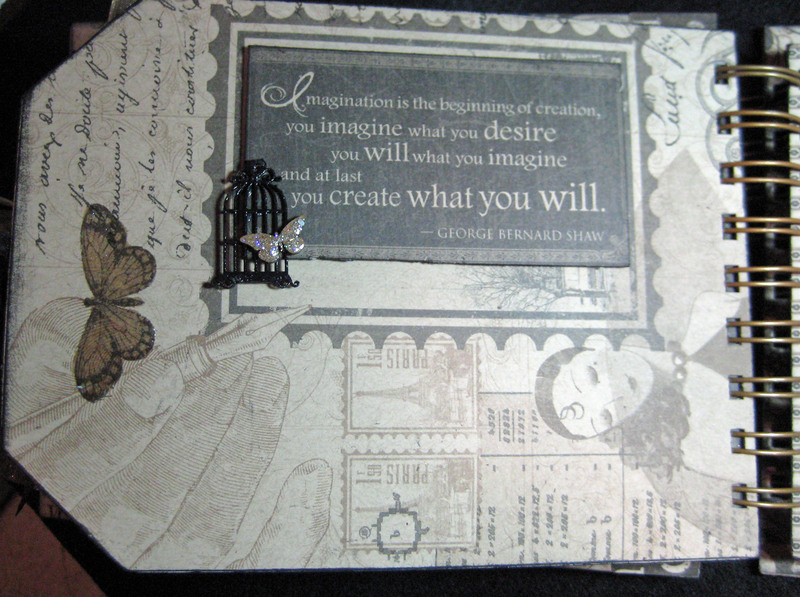 I can’t even tell you how I found her, but I watched her video the other night and figured I could use my envelopes and achieve a similar effect for the book’s pages. 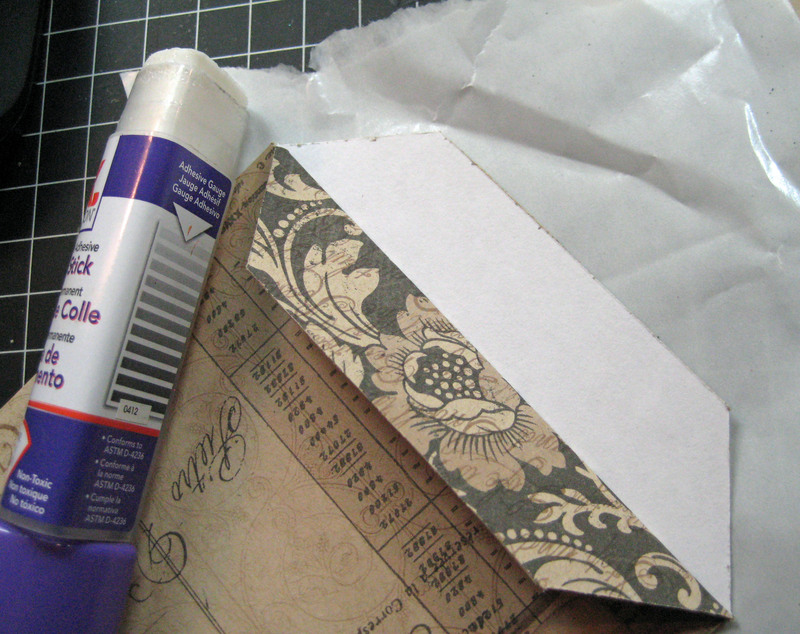 I glued the papers to the envelopes with the Xyron Glue Stick and used the Xyron’s peel-off waxed paper as a protector. I assembled five pages for the book. The book’s pages are all sliced open on the end so I made five large tags that slide into these and are great for photos, journaling or more quotes! 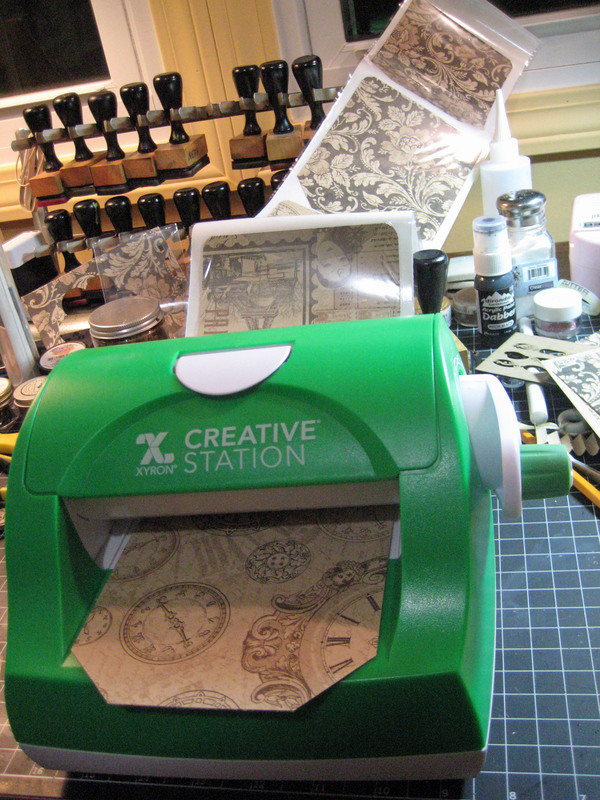 The tags are all hand-cut and put through the Xyron 5″ Creative Station. I’m often asked why I use my Xyron machines so often – here’s my answer. I love using my Xyron machines because the adhesive is clean and neat and holds really well – it’s also so very quick! I have books I’ve made more than eight years ago using my Xyron and the pages have held up really, really well. I’ve calculated my cost and it usually runs $1 a foot to use my larger machines. I’m careful how I run my papers through and have very little waste. I can process a lot of pieces in a foot of adhesive and if I buy my refills on sale it costs even less! 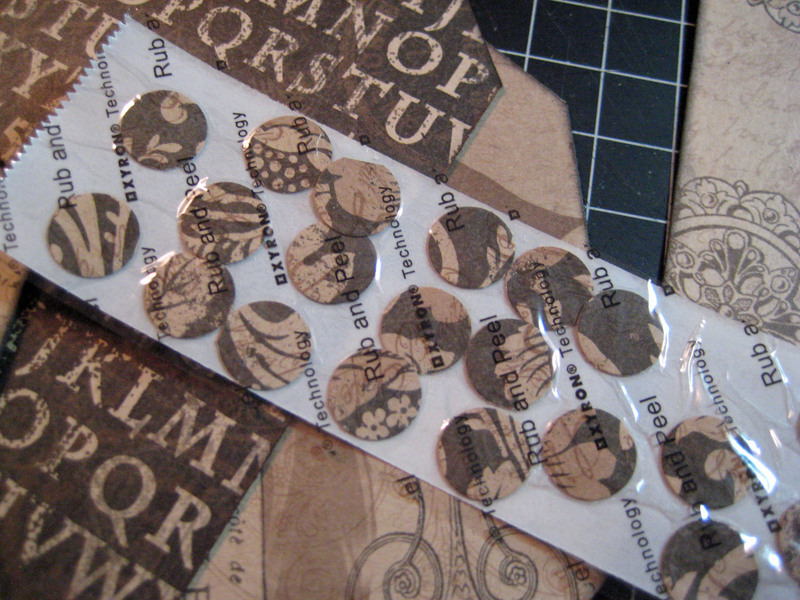 Large eyelets are so hard to find nowadays and I like to reinforce my tags before adding a ribbon so I make my own coordinating reinforcers using a 1/2 inch circle punch and a 1/4 inch circle punch. I run the 1/2-inch circles through the Xyron 1.5″ Create-a-Sticker and adhere to the tag tops then punch the center opening with the 1/4-inch punch. 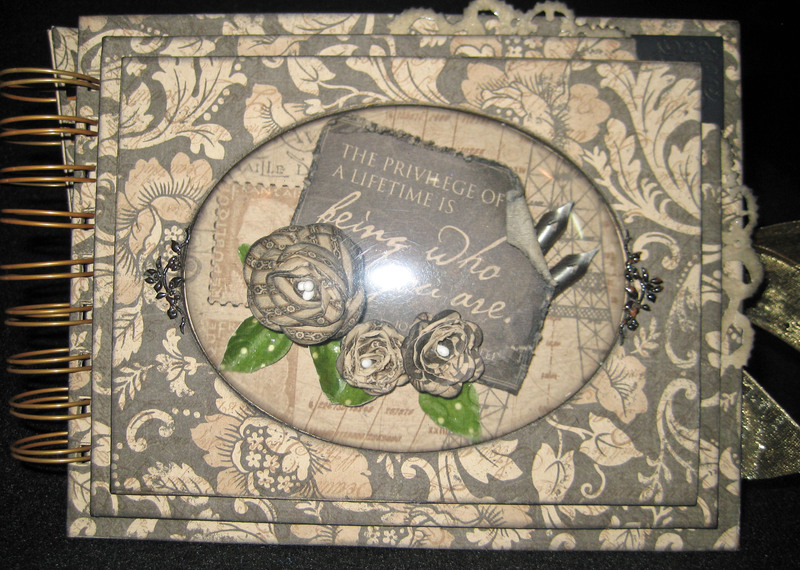 I proceeded to decorate the pages using several Globecraft Memories Piccolo Decorative Accents (Small Flourishes, Butterfly Flurry Flourishes, Kitty Loves a Birdie Necklace, and Vintage Hearts Charm Set) and the remaining quotes from the paper collection. It made for a really cute book and the quotes, Piccolos and other hand-made embellies were really easy to work with and the retain the color scheme of tan and black.These are small compressed book board pieces that are just loaded with tons of detail and they’re so tiny so are perfect to use as embellies or charms. 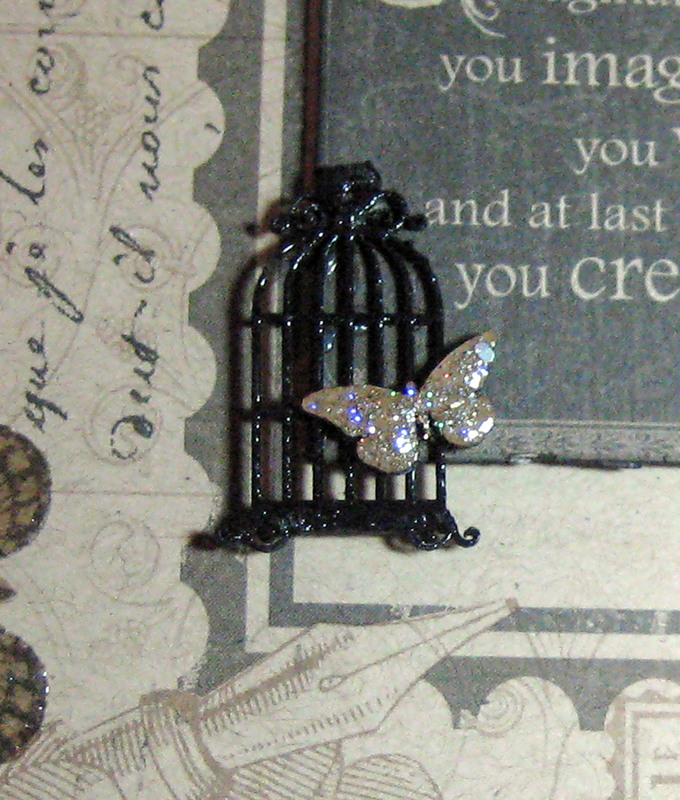 I painted all my Piccolos black and then dipped them in clear embossing powder and heat set. Take a look at the book’s cover and pages to see all the Piccolo pieces. Those are little Piccolo flourishes from a set that sit on either side of the globe. Hope you enjoyed this little project and can put some of these tips to good use! Be sure to stop by the Xyron and Globecraft Memories blogs each day this week for loads of great projects and ideas! All your Globecraft Memories products can now be purchased through my blog by clicking on Globecraft Memories Piccolo box to the right. It will take you directly to the store where you can purchase any items I used in this project. Thanks for stopping by and enjoy the projects from the rest of the design team members! What a beautiful book, Linda! I’ve never seen the bubble like that…. I love how it protects your stacked flowers. Great idea! This project is absolutely georgous! Thank you Karen, I enjoyed making it! Love the Graphic 45 papers.